Get everything you need for target shooting or hunting. 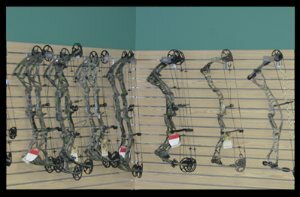 Whether you need a bow, arrows, calls or even clothing Jim's has it. Stop in and check out our wide selection of shooting equipment and accessories from great manufacturers like Hoyt, Bowtech and Easton. Our trained and experienced staff can help size a bow to ensure a perfect fit and consistant release point. Jim's Pro Shop services all brands and styles of bows for all levels of archer.